Who is Ekornes and How do They Make Such Great Furniture? Ekornes ASA is the largest furniture manufacturer in the Nordic region and owns such brand names as Ekornes, Stressless and Svane. Stressless is one of the world's most famous furniture brands, and Ekornes and Svane are the best known brands in the Norwegian furniture market. Products are manufactured in Norway and marketed all over the world by a network of national and regional sales companies- like The Unwind Company. The vision of Ekornes is to be one of the world's most attractive ergonomically designed suppliers of furniture for the home. Ekornes' business concept is to offer products that, in terms of both price and design appeal to a broad customer base. In addition, the group aims to develop and manufacture products offering excellent comfort and functionality. Ekornes ASA is the parent company of the Ekornes Group. The group's production facilities are organized according to its product areas: Stressless (recliners, sofas, loveseats and accessories), Ekornes Collection (sofas) and Svane (mattresses which are not available in the U.S.). Ekornes ASA provides all shared services, including group management, marketing, purchasing, accounting and finance, as well as product development for the Stressless and Ekornes Collections. Ekornes gives priority to the design and development of product concepts which provide functionality and comfort to customers worldwide, and which can be manufactured to the highest quality in an efficient manner. Design and development work at Ekornes is focused on features that promote comfort and/or provide solutions to practical everyday problems for the user (e.g. back pain, neck pain etc). The appearance and choice of fabrics and leathers must appeal to the most discerning end-user. The design and development department currently employs around 15 full-time designers and product developers. The most state of the art construction tools are utilized. The department has sufficient expertise in materials and production techniques that enable it to follow the process through all the stages, from idea to final production. Quality trials and testing are carried out in the Group's own laboratories and also at approved independent institutions. One of Ekornes' competitive advantages is its ability to combine efficiency with quality. This is constantly being improved by means of standardized components and designs, which satisfy both the requirements of the market and the company's need for highly efficient production. Ekornes will be seen as an environment-friendly company, committed to recycling waste and using environmental friendly materials. Ekornes aims to minimize health risks at its workplaces. Ekornes is willing to invest in order to avoid damage to the health of the environment. Environmental information shall be included in product specifications etc. Ekornes shall not engage in environment arguments when marketing its products, but provide factual information and be seen as a responsible supplier. J.E. 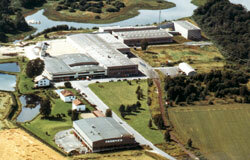 Ekornes AS in Sykkylven is the largest production company/factory within the Ekornes Group. The J.E.Ekornes AS facility manufactures Stressless chairs and Stressless sofas. One of the distinguishing features of the factory is the large number of components manufactured on the premises. Production includes the sewing department, upholstery-assembly, joinery-varnishing, manufacture and surface treatment of steel components, as well as production and formcasting of foamed plastic. The Vestlandske department manufactures the laminate for Stressless® and other furniture products. These are cutting edge skills that are built on many years' experience. Production of foamed plastic is sufficient for all Ekornes's own requirements, and a considerable amount of plastic is sold to other furniture manufacturers that appreciate the quality that Ekornes instills in all of their products. 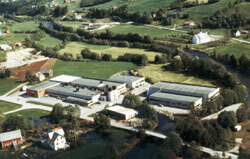 Ekornes Fetsund AS, located in Romerike, is a leading mattress manufacturer. The company runs a modern and well-equipped factory, which produces foamed plastic and Svane® mattresses. A large number of components are made on the premises. The factory's production of high-quality fiber-filled foamed plastic is recognized worldwide for its efficiency. Many other Scandinavian manufacturers purchase the surplus inventory. Ekornes Grodas AS is located at Hornindal on the Nordfjord. This factory specializes in the manufacture of internal and exposed wood parts for Ekornes sofas and loveseats. Parts are also manufactured for the famous Stressless collection. This modern production facility is also designed for the surface treating of exposed wood,and typically operates on an order-driven basis. 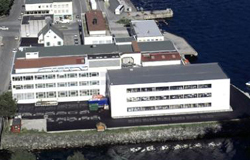 This factory is one of the two Ekornes' sofa production facilities (the other being Ekornes Hareid AS), and is the most efficient factory of its kind in Norway. Production is order-driven, and involves the assembly of wood components, sewing and form moulding. The modern machinery includes sewing machines and computer-controlled equipment for cutting according to pattern. A fully automatic conveyor-belt system, similar to car assembly lines, is used for the internal transport of finished and semi-manufactured goods. 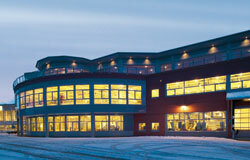 This system operates on all three floors of the building. This facility also includes a testing workshop and central fabric stores. Fabrics are tested here for weight, wear-resistance, light-fastness etc, before being sent out to the other various Ekornes factories. This Ekornes factory is approximately 43,000 square feet. It is modern and spacious and has all facilities located on a single floor. 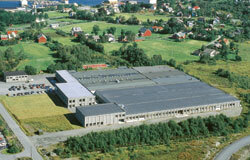 This production facility is the 2nd of two Ekornes sofa manufacturers (the other being Ekornes Stranda AS). This factory focuses on the assembly of wood components, sewing and form moulding. The modern machinery includes sewing machines and computer-controlled equipment for cutting precisely according to pattern. The Unwind Company stocks 100's of the most beautiful Stressless Recliners, Ekornes Chairs and Furniture (in our own warehouses) for the Fastest Shipping to virtually anywhere in the Continental United States!